Dark chocolate brownies made with Oktober fest beer, topped with chocolate ganache. 2/3 cup Oktober fest beer, room temp. Preheat oven to 350 degrees F. Line an 8x8-inch square baking pan with foil, and spray foil with non-stick cooking spray. Melt the butter in a small saucepan over medium heat. Cook the butter, stirring freguently, for 6-8 minutes, or unti light golden brown. Stir in beer and heat for 1 minute. Remove pan from heat, add unsweetened chocolate, and set aside to allow the chocolate to melt. When melted, stir until well combined. In a medium-sized bowl, sift together flour, cocoa powder, and salt. In a large bowl, combine sugars, egg, and vanilla, and beat together, using an electric mixer on high speed, for 2 minutes. Reduce mixer speed to low, and gradually add melted butter mixture, and beat 1 additional minute. Gradually beat in flour, until just combined. Spread batter into pan, and bake at 350 degrees F, for 35-40 minutes, or until a toothpick inserted comes out with a few moist crumbs attached. Cool on a wire rack, or do what I did: Cool pan in an ice-water bath; when cool, freeze the pan for an hour or two in the freezer. I think this process gives brownies a better texture. To make the ganache, heat the cream and butter in a small saucepan over medium heat, until hot, but not boiling. Remove pan from heat and stir in vanilla and chocolate chips, until well combined and smooth. Pour the ganache over the top of the cooled brownies. Freeze or chill, until set, before slicing. 10 comments on "Oktoberfest Brownies"
brownies. AND beer. hooray for the wonderful combination!! Secretly, I like sauerkraut (but I didn't say that). That's interesting about beer in brownies! Maybe these are the new "special" brownies. lol kidding. I'll check back later when the pictures are working to see what they look like! Very cool idea Emilie! 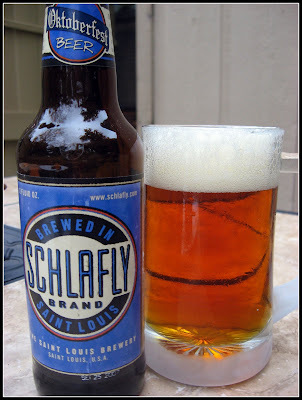 This reminds me of the Creme Brulee with Alagash beer I saw on a menu when we were in New England! Very creative, indeed! I couldn't see the picture!! And it sounds so good too. We make wine cookies so why not have beer brownies?? Val- These are the new "special" borwnies. Heh heh. I don't know why the pictures aren't working! Sometimes they work. Jenn- Creme Brulee with Alagash beer sounds good! Julie- I don't know why the pictures aren't showing up. I'm going to look into it. Wine cookies sound good! I love booze. I see the pics now!! Good God do they look good. I mean such chocolaty goodness all in one neat little package - Yummo! That brownie looks divine!! So creative. 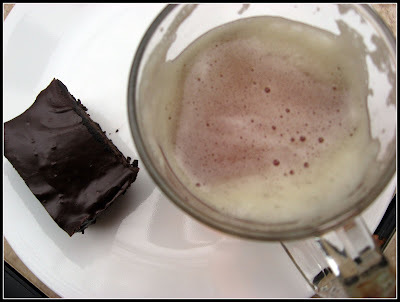 I have to admit that before I could see the pictures I had some reservations about a beer brownie. They look fantastic. I love making beer bread, so I'll have to try these out too. Julie, I took off the pictures, then uploaded them again. Maybe that helped. Anj- These are really good. You can't even taste the beer. I want some beer bread now. Guten Morgen! 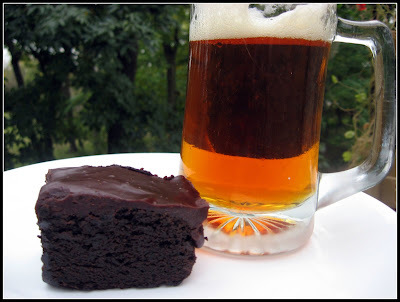 Beer in brownies would be something new to me, but when I think about it it would have a wonderful flavour. I use beer in my marinade so why not in my desserts too!!!! I will have to try this one for sure.